Japanese skier Tae-Young Yasunaga Ogita (35 ans) is trying to reach North Pole leaving from Ward Hunt (Ellesmere Island), solo and unsupported. As the expedition website is only published in Japanese, we can not give all the details of this adventure, although we use Google translation. And as far as the follow up is concerned we'll try to do our best to keep our visitors well informed. It seems anyhow that this japanese adventure has several trips in the Arctic and high Arctic under his belt. Until now he used to travel with companions ; but this time, he has decides to try the trek Ward Hunt > North Pole siolo and unsupported. 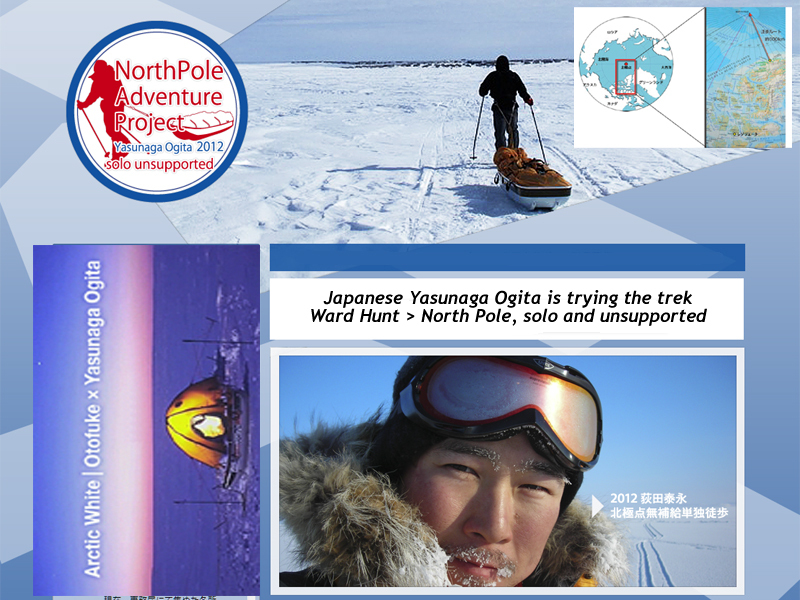 It seems that on 11 March, the Japanese soloist all together with the other expeditioners of the season are still stuck in Resolute Bay, although they should have left much earlier in the season (this is not the case for the Irish skiers who are already on the ice). Heavy blizzards are blowing in this part of the Arctic, preventing the Ken Borek's Twin Otters to take off and flyhing to Ward Hunt, where the adventurers should start their trek towards North Pole.